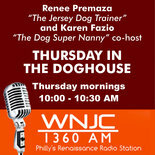 I used to do a radio show called “Thursday in the Doghouse” on local station WNJC-1360AM. I had to give up doing my program due to some serious health issues in 2012, but many of the podcasts are right here on my website. Each podcast lists the topic that was discussed on that day. If you want to save the podcast to your own computer or portable media player, right-click the link and save it:-) So, sit back, relax, listen and learn a lot about dogs, their behaviors, and how to effectively train our favorite companion pet.